lynette marie: Cinderella & her Prince. So my husband and I were driving home the other night, and me, being the whiney wife that I occasionally am, said that I missed the days when we were dating (and not on a strict budget) and Matt would surprise me with little gifts every once in a while. Now that we're married and have financial goals, we stick to a pretty tight budget, which doesn't leave Matt a ton of room to buy me pretty things too often. 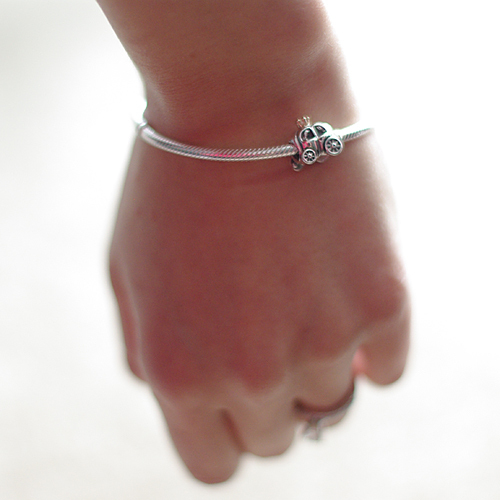 A beautiful Pandora bracelet and charm. He said the charm was a carriage, representing our new marriage, us and our fairy tale. Since we met each other, he's called me his princess, and I've called him my knight in shining armor. We cry like babies when we watch Disney princess films and see the prince sweep the princess off her feet, because we so fell for each other just like a fairy tale. Lesson learned: If you want something bad enough, complain about it to your husband. No, no, wait.. that's not the lesson. This is: marry a good man, ladies. Marry a good man. That is SO sweet! I love the carriage too. Too cute. That is so sweet. My grandma got the carriage charm for her trip to Disney. Pandora bracelets are great at holding memories, love them! Yeah, I have a Pandora bracelet and love it! I got charms for a number of birthdays and Christmases. You will love it! I love this bead too! Whoever you end up with, make sure he's a good guy who would go to the moon for you! Awwww! Does he have a single brother?! ;) Love this story, little lady. You deserve a prince! What an adorable post! I also got a Pandora bracelet from my fiance too, woohoo! How great is that?! Love a good man, love that I have a good man too :) Looking beautiful in you last post too! Perhaps we could follow each other? OMG Lynette. This is the cutest thing I have ever heard. Talk about a fairy tale!! That is the sweetest thing ever. It is moments like those that make your heart flutter and then you realize how lucky you are. All I can say is, awwww!! !